Clear Creek Associates, in conjunction with BESST Inc. and General Pump Company performed a well reconstruction evaluation on Wells No. 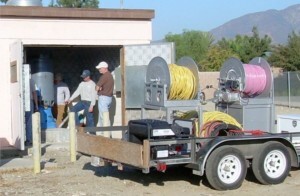 27A, 24 and 31 for the San Antonio Water Company in Upland CA. The issue at Well 27A was production rate decline and bacterial problems, and the issues at Wells 24 and 31 were escalating concentrations of DBCP and nitrate. The goal of these well evaluation projects was to assess the feasibility of reconstruction (structural modification) of the wells to improve pumped water quality. For each of these projects, Clear Creek reviewed existing historical well records, provided analysis of video surveys of the wells, provided oversight and analysis during dynamic (pumping) flow profiling surveys, and collected interval-specific water samples for analyses. The dye injection flow profiling method was used to quantify depth-specific groundwater contributions in each well, along with collection of interval-specific water quality information. As a result of our analyses and recommendations, Wells No. 27A, 24 and 31 were all modified with an engineered suction tube and/or inflatable packer, which resolved the water quality and water production issues.